There are so many great reasons to ride your bike: It offers fun, freedom and exercise, and it’s good for the environment. We want kids and families to ride their bikes as much as possible. During National Bike Month in May we celebrate the unique benefits of bicycling to promote health, preserve the environment, explore the community, and just have fun! Walk and Bike to School Day alerts your community to the benefit of sidewalks, bike lanes and traffic calming measures to improve safety and build support for infrastructure improvements. Is your child walking or biking to school on May 6? Get involved with your school to encourage or support a Walk and Bike to School Day event. 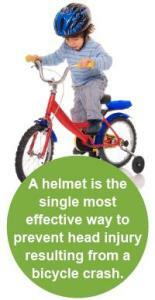 Keep your child safe on a bicycle by making sure he or she wears a helmet and follows basic safety rules. More children ages 5 to 14 are seen in emergency rooms for injuries related to biking than any other sport. Helmets can reduce the risk of severe brain injuries by 88 percent – yet only 45 percent of children 14 and under usually wear a bike helmet. Be a good example by wearing a helmet when you ride a bike! Actively supervise children until they are responsible to ride on their own.